The Converse Blog: The Converse Blog's 2008 State of the Brand, by a Fan. The Converse Blog's 2008 State of the Brand, by a Fan. With the start of the 2008-09 basketball season just weeks away, I thought it would be a good time to start a new annual post. Given that this is the basketball new year, I think it is fitting to call this the State of the Brand by a Fan. I want to approach this as objective as possible, but that will be hard considering I am “blinded” by the Star. This past year has been marked by the celebration of the Converse Century. The year long celebration of 100 years of Converse has been very exciting. There have been some unexpected releases and aspects to the celebration. 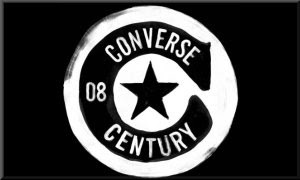 In January of 2008 the Converse Century logo debuted which linked all the way back to some of the original Converse logos with the wide open C. It also featured the new Circle and Star logo that Converse began using in the summer of 2006. Early 2008 also saw the beginning of the Converse One Star collaboration with Target. New apparel for Men and Women along with shoes for Men, Women, and Children started showing up at Targets around the country. For the first time in years I didn’t have to travel to large cities or places with Converse outlets to get Converse clothes. For the most part the collection has been casual wear with only a few items going towards performance. I would include sweats and swim wear in this category. As part of the Converse Century celebration, a large number of celebrities from around the world were featured in ads that were customized for each nation that used them. This pattern of people standing side by side was used when Converse released the song, “My Drive Thru.” The paper cut outs were used in the music video for the song performed by Pharrell, Santogold, and Julian Casablancas. This ad theme was used a third time this year, but I will talk about that more later on. Converse also rolled out a continuous stream of viral websites; most of them are featured at ThisIsTheIndexPage.com. I can’t really do any of them justice here, so you’ll have to go and check them out for yourself. Some of the more popular pages have been kissing with Ross and out of your league girl. I would hope that these would continue as they’ve even included some of the basketball side of Converse into the micro sites, with Marquette Will Be Back, Weapresent, Its been way too long, and Wheres Dwyane. This past year has also seen an increased amount of products from the ongoing Converse John Varvatos collaboration. Also recently for the first time the clothes have been made available on Converse.com. Speaking of collaborations, one of the more important century celebrations for Converse has been the 1Hund(red) artist campaign. As part of the ongoing relationship with Converse and Product (Red), Converse commissioned 100 different artists to design a Converse Product (Red) shoe to be released in the 100th year of Converse. Also this year Converse has sponsored a select number of concerts around the country. All were part of the Converse connectivity campaign that I’ve mentioned above. These concerts featured such acts as The Black Keys, Dr. Dog, Sonic Youth, N.E.R.D., Bad Brains, and The Hold Steady. Tickets for all of these concerts were only $10. In the past year Converse made a more solid attempt to return to the Skate market. Release Skate versions of Converse classics like the Chuck Taylor’s, Pro Leather’s, and the Weapon. Although Converse has produced a few models in performance Skateboard for the last few seasons, a more serious push is on the way. Adopting the “CONS Skateboarding” name in the coming year the SB line will increase. Also, at some point I expect an official announcement on the members of the new Converse Skateboarding team. If you search around online you can find a list of those believed to be on the new Converse team. You can also find pictures of the new SB product being released this year, including a skate version of the classic CONS ERX 300. I am really excited because for the first time in years Converse is expanding into another category of performance footwear, now if it were only in a sport I actually participated in. This brings us to a discussion on Converse Basketball. It’s not a secret that Wade 3.0 didn’t move as many units as Converse, or well anyone associated with the brand, would have hoped. It probably didn’t help that Dwyane Wade missed a great number of Games in 2007-08 and that his team finished with the worst record in the NBA. However, not all was lost for the past year for Converse basketball. Two shoes, the Converse 099 and the Converse Hops were embraced by the sneaker community and I’ve heard more than a few times that both shoes were steps in the right direction for Converse. As for the Endorsement front, last year was a huge year for Converse. Not only did they sign rookies Alando Tucker and Acie Law IV, but they also inked Elton Brand to an endorsement year. 2007-08 also marked the first year of the partnership between Converse and Marquette. For the first time in nearly 10 years Converse was back in the NCAA. Also, for most of the season Western Kentucky University wore Converse…until the NCAA tournament and their fantastic run deep into the NCAA tournament. Oh well, at least it was another step in the correct direction. Having a sponsored NCAA team wearing your jerseys and shoes is a moment to stand up and let everyone know that you’re serious about performance basketball. Then last year during the NBA finals against the Lakers and Celtics converse came up with a hit in the apparel department. The concept was the Weapresent Boston/L.A. t-shirt which was a play on the classic Converse Weapons worn by classic Laker Magic Johnson and classic Celtic Larry Bird. Four different versions, two for each team, were passed out to fans before each of the games in the NBA finals. Converse also started a new grassroots basketball movement called the Converse Open Run. The concept and straight forward and beautiful if you love the Game. Rent out a gym and let people play basketball...okay so it's slight more detailed than that but I am paraphrasing. Look for the Open Gym to expand in the coming year. Converse also continued a very exciting collaboration with The Black Fives. There were many different collaborations that came out this year in celebration of the Converse Century. Check out BlackFives.com for more information and for the products available. Looking forward to the 2008-09 basketball year for Converse we begin in the NBA. To me this appears to be a transition year for Converse in the NBA. For the first time since the start of the 2003 NBA you can actually see on Converse.com which NBA players are wearing Converse. They took a step last year when they actually put some pictures of the endorsers online, but there wasn’t any information about them. Unfortunately, the list of endorsers has decreased. Andre Miller who had been with Converse since 2001 is no longer listed as an endorser and so far he has been wearing Adidas during the regular season. This is a real shame as people were finally starting to take notice of his great play over the last few years. This is especially disappointing given the amount of attention the 76ers will receive this year with the addition of Elton Brand. Also Jameer Nelson is not listed on the website, but so far this year he has continued to wear Converse during games. I have no idea if he is an official endorser or not, but either way he has continued to wear Converse. Besides these 1 to 2 departures from Team Converse, there have been no additions to team Converse…at least for now. As a die hard Converse fan this is particularly disheartening. In a year when it has been reported that Adidas and Nike were not throwing around the type of endorsement money they have in past years, it seemed like a perfect opportunity for a brand like Converse to increase their roster. According to my estimations Converse currently ranks 5th place for the amount of NBA endorsers behind Nike, Adidas, Reebok, and Jordan. However, more competition is coming in the next years. Under Armor is now getting into basketball footwear which will surely grab a large portion of market share. Also, Pony is taking serious steps in performance basketball. Not to mention the three major basketball companies from China, Li-Ning, Peak, Anta will look to increase their presence in the NBA. An already competitive market is about to get more crowded. For the NCAA it looks like Converse won’t have any teams besides Marquette. Technically a decrease from last season since WKU will be wearing Nike from the beginning of the season. This is also pretty frustrating for me because there is even less competition in the NCAA. Only a handful of teams wear anything besides Nike and Adidas. With all of that being said, I am fully aware that you can’t force a player or team to sign with your company. I have no idea how close Converse was to signing any new players or teams. And it’s not like the people in charge don’t want to add players or teams, sometimes stuff just doesn’t go your way. The truth is that just because Converse hasn’t added any new players by the start of the season doesn’t mean they can’t add players through out the year; in fact Andre Miller was signed during All Star weekend in 2001. So I am not giving up hope yet on additions to the Converse roster this year. Now that I’ve addressed some of the negative aspects of Converse basketball, there is plenty of reason to be optimistic for the future. For the first time in, well, a really long time, Converse has two endorsers worth of signature shoes. In addition to the Wade 4, Converse will also release the EB1. This is Elton Brand’s first signature shoe. I won’t spend much time here as various post have been made on both shoes, you can search in the archives on the right for pictures and info. For 2008-09 Converse has increased the number of team shoes from three to four models. And for the first time in a really long time, Converse has made a team shoe for girls’ basketball. It is a female edition of the Converse Team Assist. Also for the 2008-09 basketball year Converse has finally released shoes with some real forward thinking technologies. The technology in the 0100 is more of a new technique in the construction process; however I will say that the 0100 might be the most comfortable pair of Converse I have ever worn. At the very least, go and find a pair of 0100’s and try them on, you won’t be sorry. Also as previously mentioned in another post, the new Wade 4 has Converse suspend technology in the heel. I am so very excited to see what this new technology is all about and to see it used in more products in the coming year. This last section of news may or may not be positive, truly only time will tell. Recently Converse Basketball moved from the Nike Campus back to Converse HQ in North Andover. In this moving process it looks like Duane Lawrence and some other designers have left Converse to stay in Beaverton and work for Nike. Duane has been the designer for the all of the Wade signature shoes as well as the EB1. Depending on how you feel about the Wade signature over the years you may be excited about new blood designing for Wade or you maybe truly concerned for the future of the line. I am excited to see how this will affect Converse in the coming year and into the second Converse Century. This transition phrase from Oregon to Massachusetts might have more to do with the lack of growth of NBA and NCAA endorsements for Converse. Either way, I have full confidence in the Converse basketball team for the future of the brand. However, for me the honeymoon with Nike is over. I am thrilled that Nike stepped in and purchased Converse, but the truth is that the brand is off of life support, and has been for a few years now. It’s not enough that Converse is still alive, now is the time to thrive. Does Nike really need the number of NBA and NCAA endorsers they have? The answer quite simply is no. Do we really need to see 120ish people wearing Hyperdunks? It would be better to increase the market share of endorsers for Converse and increase the strength of Nike’s overall basketball portfolio and not just 2 out of 3 brands. It has been a wonderful and wild ride during the first Converse century. It would be hard to match the success that Converse had in its first 100 years, but the pieces are in places to do just that. Domestically and Globally Converse is poised for an exciting and successful 2nd century. In a small way through this blog, it is a Converse Century that I can’t wait to be a part of. If I left anything out please let me know, or if I got any of the information wrong please let me know. There is a good chance that I did on both counts.